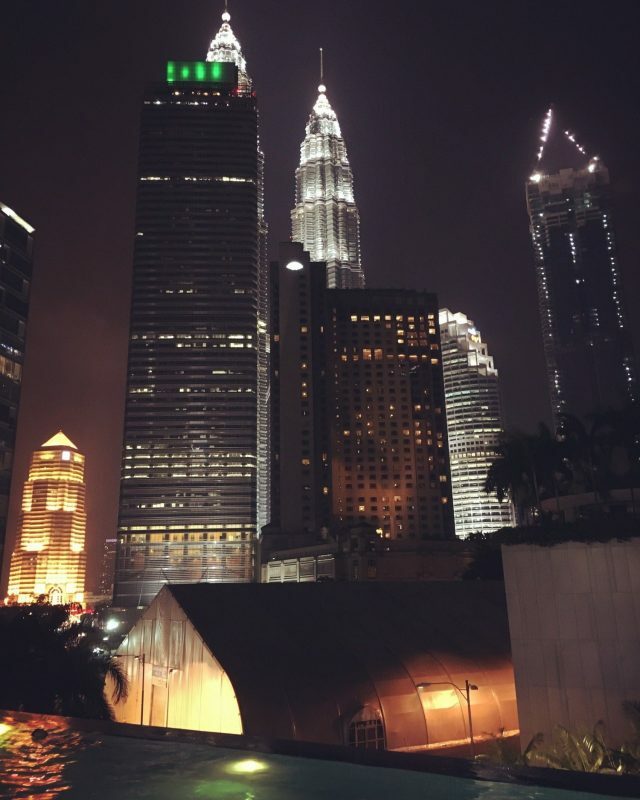 Kuala Lumpur, Malaysia is a vibrant city with so much to see and do. It also offers some amazing luxury hotel accommodation that provide wonderful facilities. Some of the 5 star hotels in Kuala Lumpur are among the best in the world. Here’s our guide to the 10 best hotels in Kuala Lumpur. 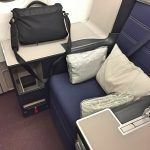 Looking for a Kuala Lumpur airport layover hotel? We highly recommend the fabulous Sama Sama Hotel KLIA – check prices here. The Grand Hyatt Kuala Lumpur is definitely one of the best 5 star hotel in Kuala Lumpur. Conveniently located right next to KLCC (Kuala Lumpur Convention Centre), it has one of the best hotel pools in Kuala Lumpur. It’s walking distance to the Petronas Towers, KLCC Park and The Pavillion shopping centre. The spacious rooms in this KL hotel offer floor to ceiling windows, giving amazing views of the city and KLCC park nearby. The beds are extremely comfortable and a coffee machine is included in the room. 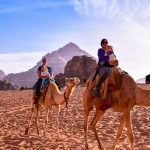 The hotel offers several dining options including THIRTY8, offering a range of Chinese, Japanese and Western dishes; JP Teres with indoor dining and an outdoor terrace; and the Poolhouse open for all-day dining. If you’re after a room with a view, then it doesn’t get much better than looking out on the iconic Twin Towers through the floor to ceiling windows from your bed! Traders Hotel Kuala Lumpur is also the perfect place to stay if you’re looking to do some shopping in Kuala Lumpur, being located right next door to the fabulous Suria KLCC shopping mall (you can even climb aboard one of their free shuttle buggies to access the mall). The hotel also features an indoor swimming pool, a steam bath and a hot tub, and a 24-hour fitness centre. The gorgeous 5 star Shangri-La Hotel is only a five minute walk to the KL Tower and Petronas Twin Towers. The hotel features six restaurants serving Japanese, Chinese and international cuisine. The poolside terrace is a wonderful place to grab a drink and relax. The lobby of the Shangri-La is next level, and decorated with beautiful orchids. The friendly staff are very efficient at welcoming you and checking you into your room. The beautifully decorated rooms feature large windows with city views, along with a flat-screen TV, complimentary water, tea and coffee making facilities. Plush bathrobes and toiletries are provided in the bathroom. Transfer services to and from the airport are available. Click here for further information and to see the latest prices. If you’re looking for somewhere special to stay in Kuala Lumpur, then the Mandarin Oriental hotel should be top of your list. This amazing hotel features suites and serviced apartments overlooking KLCC Park and the city skyline. You won’t go hungry with ten different restaurants to choose from, and other great facilities include an indoor golf course, tennis courts, fitness centre, spa, one of the best infinity pool Kuala Lumpur with cabanas and day beds. The luxurious rooms feature marble bathrooms, Smart TV and bluetooth radio. Click here for further information and prices for the Mandarin Oriental Kuala Lumpur. 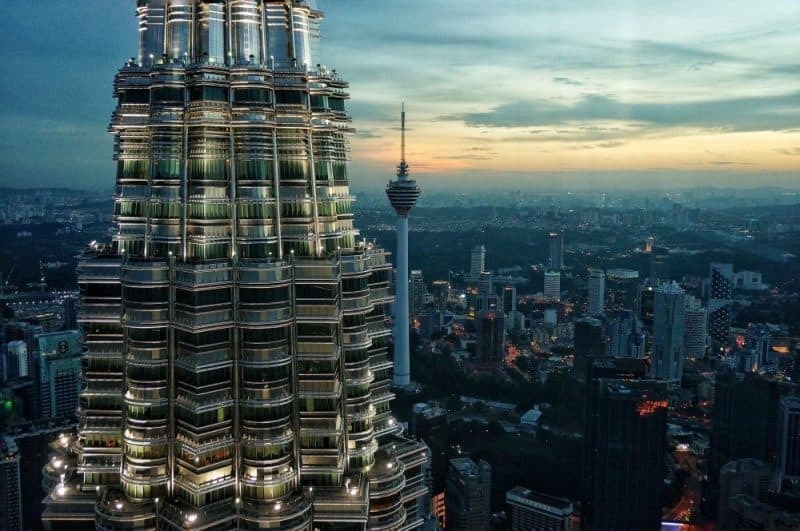 The four star Impiana KLCC Hotel is extremely good value for money and offers a stylish, modern hotel that’s convenient to everything in Kuala Lumpur City Centre. Our room was spacious, with an extremely comfortable bed, modern decor with great Wi-Fi. 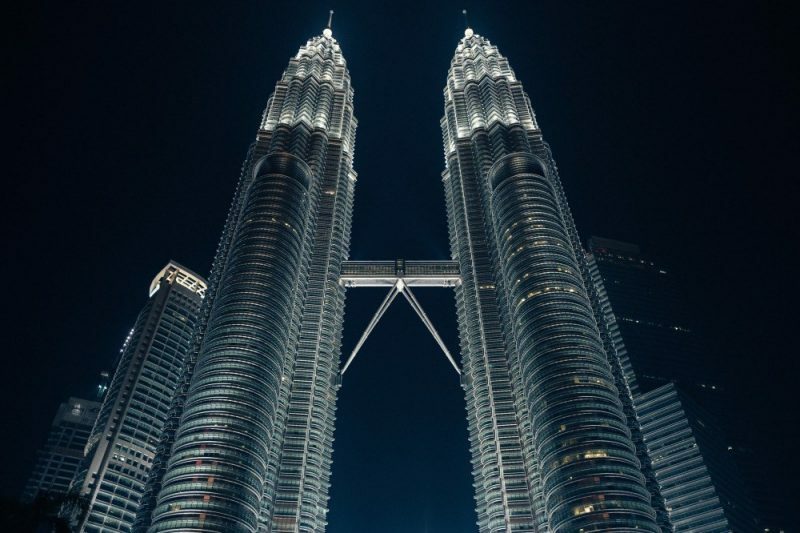 One of the best things about the location is that it connected to KL Convention Centre, Suria KLCC Shopping Mall and the Petronas Towers via an air-conditioned skybridge. You can also walk over to Bukit Bintang on the sky bridge, one of the main shopping and eating areas in Kuala Lumpur. The pool is also fabulous, offering wonderful views of the KL skyline, particularly at night. Check prices for the Impiana KLCC Hotel and book here. 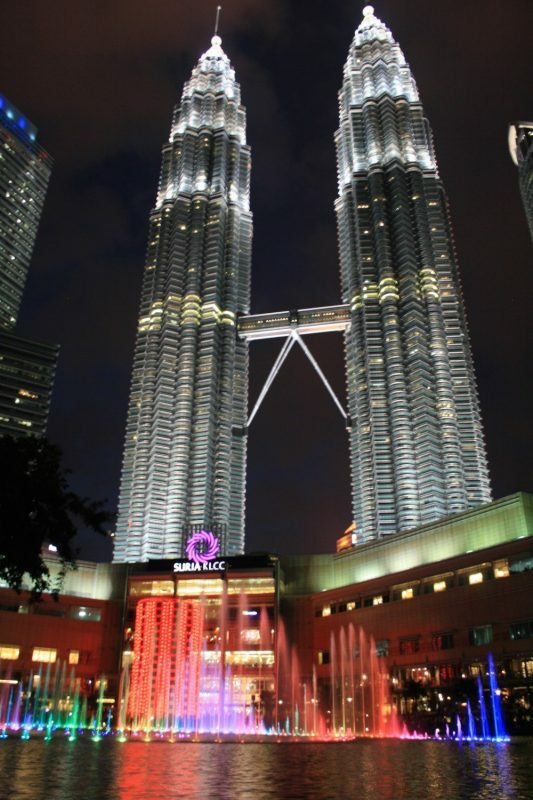 The Four Seasons is one of the luxury hotels near Petronas Towers. It’s one of the top hotels in Kuala Lumpur thanks to its luxury rooms featuring beautiful views of the city, pool or garden or KLCC park. Room features include extra large double beds, hypoallergenic pillows, hairdryers, toiletries and a great shower. The hotel has some of the best restaurant in KL, with six dining options including live cooking options at Curate’s show kitchen! A fitness centre, spa and amazing pool also feature. 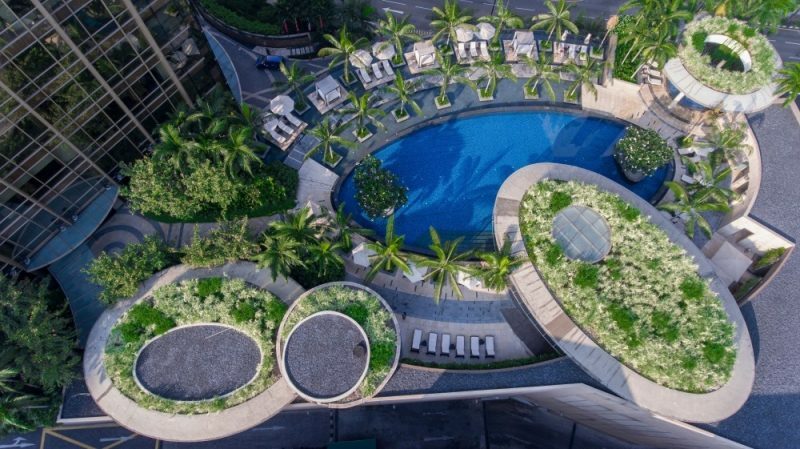 Check prices and book the Four Seasons Hotel Kuala Lumpur here. The Concorde Hotel gets consistently good reviews, and is another great option for hotels in Kuala Lumpur city centre. 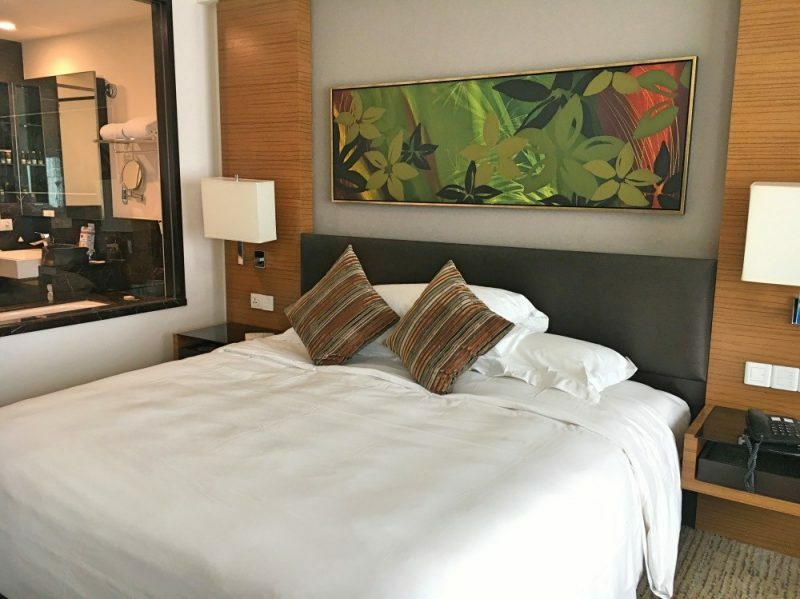 Guests love the spacious rooms, fabulous breakfast buffet and the wonderful location not far from Petronas tower, KL Tower and right next door to the Bukit Nanas monorail station which will transport you quickly and efficiently across Kuala Lumpur. 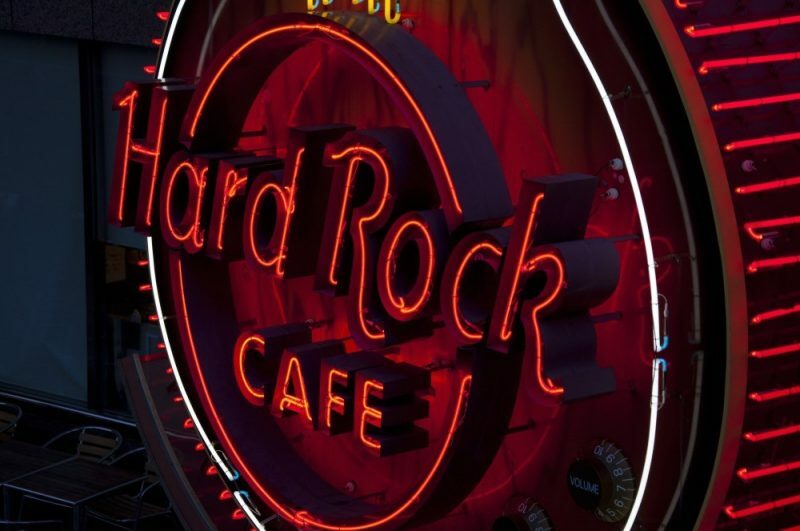 Eating options include the Melting Pot Cafe for Asian specialities, Chinese dishes at Xin Cuisine and for a fun night out it’s right next door to the Hard Rock Cafe. Check prices for the Concorde Hotel Kuala Lumpur here. The rooms at the 5 star Pullman Kuala Lumpur City Centre Hotels & Residences feature either city views or views of the Petronas Towers. The rooms have been recently renovated and feature satellite TV, comfortable beds, toiletries and a hairdryer. The hotel location is excellent, directly opposite the Pavillion Shopping Centre. The hotel features six dining options, a great outdoor pool and there’s free parking on-site which is handy if you plan to rent a car during your stay. The Pullman Kuala Lumpur also has a spa where you can have a relaxing massage. Babysitting services are also available on request. Check prices for the Pullman Hotel Kuala Lumpur here. Although not strictly located in Kuala Lumpur City Centre, The St. Regis Kuala Lumpur hotel is well worth consideration because of its amazing luxury accommodation and facilities. It’s in nearby KL Sentral, and still close to all of the highlights and things to do in Kuala Lumpur. The St Regis. Kuala Lumpur takes luxury to the next level, and its certainly a top luxury hotel Kuala Lumpur. Room features include floor to ceiling windows, large seating areas, walk-in wardrobes, vanity table and desk. Featuring some of the best restaurants in Kuala Lumpur, the world class sushi restaurant comes highly recommended by guests. Check prices and availability for The St. Regis Kuala Lumpur hotel here. If you’re looking for an aparthotel with stylish design, you can’t go past Element Kuala Lumpur by Westin. Designed by Foster and Partners, it’s the tallest eco hotel in Kuala Lumpur, standing at 275m high – guaranteed amazing KL skyline views! The apartments feature stylish neutral decor, with marble bathrooms, flat screen TV, toiletries and a hairdryer. The hotel has great facilities such as an indoor pool, fitness centre, spa and restaurant. It’s a short walk to the Suria KLCC mall, park and Petronas Towers. Check prices for Element Kuala Lumpur by Westin here. Disclaimer: this article contains affiliate links. This means if you make a booking after clicking on one of these links we may receive a small commission at no extra cost to you. hello! thank you for give such a great information about Kuala Lumpur appreciate it bro.